I know the Gn15b APA module wasn't as successful as we hoped, but wondered if there was anyone interested in doing something in 1/35. I am thinking with WW1 centenary that that could make a good theme, aiming to build a large modular layout sometime over the next 4 or 5 years. Just a thought. Either way I am planning a set of 3 APA boxes to make a working circular display. I think one of the problems with the Gn15 set up as that it only ran from one end to the other and back, even when we double stacked it. To have as much space I am planning to use the boxes on their bottoms, rather than on their sides as e did with he Gn15 one. I am thinking that each module will have pointwork and be able to be positioned in middle or side. The geometry will be slightly different to my other 1/35 APA box layout, where I need the height so boxes were same way as the Gn15. I have started on the new WW1 project. I wanted to get as much as possible in each box, and thought doubling the space would be a way. Basically cutting box in half(almost) the extending other half using the lid as a base. 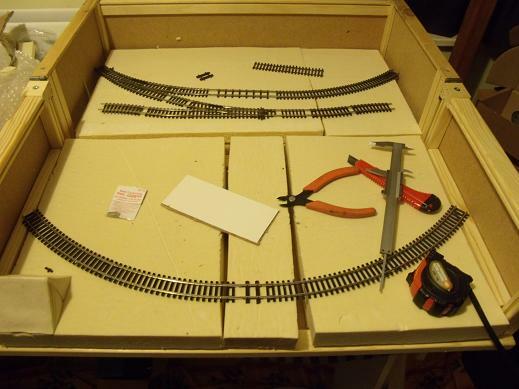 I don't intend to connect each half with track, but might be an idea for another project. Each half can be connected to other modules. It might even be possible to connect something to both at same time. I plan to fill up space between tracks with various WW1 vehicle I have. Being kit based they tend to get broken if moved around so need a more permanent home. This one will be lorries, another will be tanks and a third will have an airplane. There will be a slightly twisted them to each,one aim being to make people think about war and railways. I have had to use a new source of styrofoam. Not so keen on it as had to remove metal coating. Also don't think it is as strong. Should be OK for this project. Height is not so much an issue as there are no tall buildings. Some vehicles might stick out, but by tinkering with positions, there should be no problem when folded up. Main thing is to keep models safe. no shortage of inspiration. Sure to be a lot of fresh film and photos surfacing this year. I have actually seen that piece of film recently, but always worth watching again. One of the things I want to get over to people is the similarity between each side of the conflict, and how pointless it was. As well as showing how much better railways were than other methods of transport. I have also heard that Roy Link has a book planned for release, hopefully this year. That should generate even more interest, and heated discussion on what ran where and more importantly(for some) what colour it was. I have almost got to the end of loco and wagon production, first exhibition just over time, but then I have till March to get everything working properly on current module. The new module might be in a state to be seen, but not operational till all 3 modules built. The Place de La Victoire module is only intended for small trains, mainly protected Simplex operated. Unfortunately I have found those new fangled low profile heels don't like my trackwork. Again I say, give us something that works rather than something that just looks pretty. I have a few ideas, but if someone produced alternative wheels for the Tenshodo unit I would fit them.Fortunately I have a couple of pizza type modules they can run on.